The Regalia Resort & Spa Nanjing Qinhuai River is located in the vibrant city of Nanjing, just 5 km from the center of the city. With it's convenient location, the hotel allows guests to easily visit all of the major local attractions, including the International Trade Market, Zhonghua Gate, and Imperial Examinations History Museum. The hotel is also situated just 26 km from the airport. Regalia Resort & Spa Nanjing Qinhuai River has 37 comfortable guest rooms featuring elegant modern décor and hardwood floors. Each well-appointed guest room comes equipped with a private bathroom, sitting area, TV, and complimentary LAN internet access. Guests of the hotel are encouraged to take advantage of the many features available, such as meeting facilities, laundry service, airport transfer, modern fitness center, spa, peaceful garden, guided tours of local attractions, and concierge service for convenience. The hotel also features a full-service bar and a restaurant serving delicious regional cuisine. Regalia Resort Spa Nanjing Qinhuai River in Nanjing! 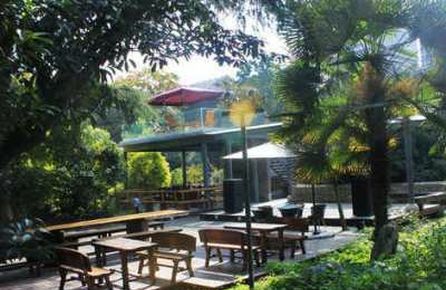 The Kayumanis Nanjing Private Villa & Spa is located adjacent to the Najing Ape Cave Scenic Area, 28 km from downtown Nanjing. The 5-star hotel provides a peaceful retreat from the busy city, while allowing guests to easily access all the restaurants, shops, and entertainment the city has to offer. The hotel is also situated near the Nanjing Yangshan Tablet Stones, and 48 km from the airport. Kayumanis Nanjing Private Villa & Spa has 20 comfortable and spacious guest rooms featuring elegant modern d1cor and large windows with views of the picturesque countryside. Each well-appointed room comes equipped with a private bathroom, sitting area, LCD TV, and free wireless internet access. 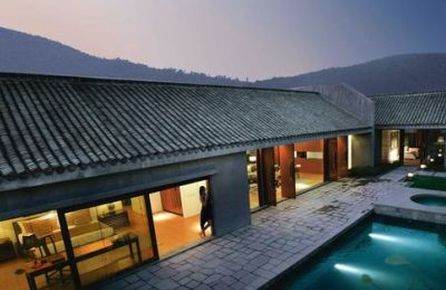 Guests of Kayumanis Nanjing Private Villa & Spa will appreciate the friendly professional staff and modern amenities, including outdoor swimming pool, hot tub, sauna, scenic gardens, spa with available massage, bicycle rental, and guided tours. Kayumanis Nanjing Private Villa Spa in Nanjing! The Nanjing Vogue Boutique Hotel is located in the Jiang Ning District of the city of Nanjing, 18 km from the city center. 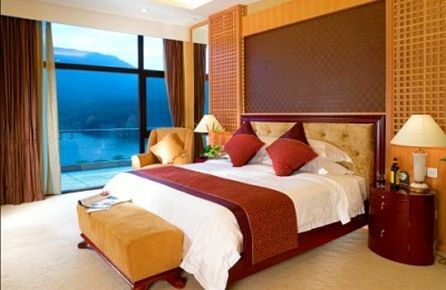 The modern hotel is situated conveniently for guests to access many of the regions attractions, including the Tang Pagoda, the Buddhist Grotto in Niushou Mountain, Jiangian Mountain, and the Two Tombs of Southern Tang King. 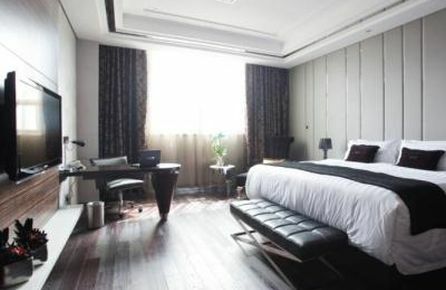 Nanjing Vogue Boutique Hotel has 33 bright and spacious guest rooms featuring modern décor and hardwood floors. Each comfortable and well-appointed guest room comes equipped with a private bathroom, LCD TV, sitting area, and free wireless internet access. The Nanjing Vogue Boutique Hotel offers a wide range of excellent features and professional services that guests will enjoy, such as meeting facilities, safety deposit boxes, Wi-Fi in all public areas, and a restaurant serving gourmet regional cuisine with available 24-hour room service. Nanjing Vogue Boutique Hotel in Nanjing! The Nanjing Xinzhilv Garden Hotel is conveniently located in the city of Nanjing, just 3 km from the heart of downtown, where many of the city's most popular dining, shopping, and entertainment options are. The hotel is also situated just 28 km from the nearest airport. 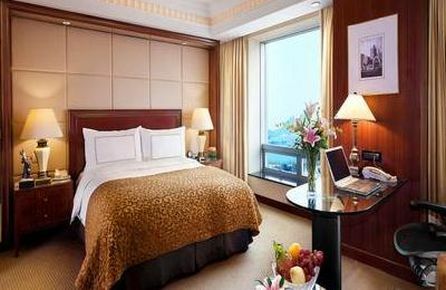 Nanjing Xinzhilv Garden Hotel has 42 bright and spacious guest rooms featuring elegant modern décor and wood furnishings. Each comfortable room comes equipped with a private bathroom with separate bathtub and shower, coffee maker, LCD TV, and free wireless internet access. Guests of Nanjing Xinzhilv Garden Hotel are welcome to take advantage of the hotel's many features, including a casino, bicycle rental, laundry service, airport transfer, and guided tours. The hotel also features a relaxing cafe, full-service bar offering delicious beverages, and a restaurant serving gourmet regional cuisine with available 24-hour room service. Nanjing Xinzhilv Garden Hotel in Nanjing! The modern Lakeview Xuanwu Hotel is located near Mount Zijin in downtown Nanjing, with easy access to a wide variety of shopping, dining, and sightseeing options. The hotel is situated close to the subway station and allows guests to easily explore the vibrant city. Nearby attractions include Xuanwu Lake, Ming City Gates, Presidential Palace, and the Nanjing Museum. The hotel is also 38 km from Nanjing Lukou International Airport. 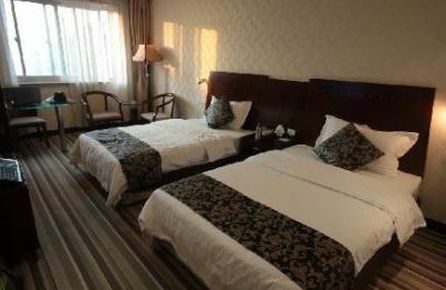 Lakeview Xuanwu Hotel has 258 comfortable and spacious guest room featuring classic elegant décor and modern amenities. Each well-appointed room comes equipped with a private bathroom, LCD TV, sitting area, and free wireless internet access. The Lakeview Xuanwu Hotel features helpful and friendly staff and offers many facilities and services for guests to enjoy, such as a casino, nightclub, lounge area, salon, guided tours, babysitting, business center, and bicycle rental. Lakeview Xuanwu Hotel in Nanjing! The 4-star Eastern Pearl Hotel is located on vibrant Zhujiang Road in the wonderful city of Nanjing, between the commercial district and business district. The area is known for its active nightlife and within walking distance to the Presidential Palace, Orient Department Store, and Ming City Walls. The hotel is also situated 35 km from Nanjing Lukou International Airport. Eastern Pearl Hotel has 144 bright and comfortable guest rooms featuring tasteful contemporary décor and modern amenities. Each well-appointed room comes equipped with a private bathroom, LCD TV, sitting area, and free wireless internet acces. Eastern Pearl Hotel features a wide variety of useful and enjoyable facilities and services, including a business center, meeting facilities, guided tours, laundry service, and concierge. The hotel also offers multiple restaurants serving an assortment of regional and international cuisine with available 24-hour room service. Eastern Pearl Hotel in Nanjing! The Cumberland Boutique Hotel Nanjing is located in the Xuan Wu District of the bustling city of Nanjing, with easy access to a wide variety of shopping, dining, and sightseeing options. Nearby attractions include Xuanwu Lake, Ming City Gates, Presidential Palace, and the Nanjing Museum. The hotel is also situated 35 km from Nanjing Lukou International Airport. The Cumberland Boutique Hotel Nanjing has 300 bright and spacious guest rooms featuring contemporary décor and modern amenities. Each comfortable and well-appointed guest room comes equipped with a private bathroom, LCD TV with satellite, sitting area, refrigerator, and free internet access. Guests of The Cumberland Boutique Hotel Nanjing are encouraged to make use of the hotel's various features and services, such as a business center, meeting facilities, shops for souvenirs and essentials, laundry service, concierge, and an airport transfer for convenience. The Cumberland Boutique Hotel in Nanjing! The Nanjing Expo Hotel is conveniently located just 6 km from the vibrant downtown area in the city of Nanjing. With easy access to public transportation and a central location, the hotel offers guests the perfect place to stay while visiting the city. Nearby attractions include Zhonghua Gate, Taiping Heavenly Kingdom History Museum, and Central Jiangdong Road, where a number of popular dining, shopping, and entertainment options are located. 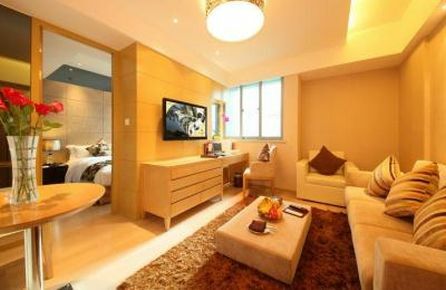 Nanjing Expo Hotel has 252 comfortable and spacious guest rooms featuring elegant contemporary décor and modern amenities. Each bright room comes equipped with a private bathroom, sitting area, LCD TV, and free wireless internet access. The Nanjing Expo Hotel offer guests a number of excellent features, including multiple meeting facilities, a business center, laundry service, guided tours of local sites, common lounge area, and Wi-Fi in public areas. Nanjing Expo Hotel in Nanjing! 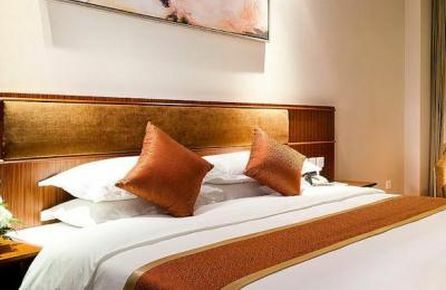 The Nanjing Jinling Hotel is conveniently located in the center of the city of Nanjing, within walking distance to a variety of the most popular dining, shopping, and entertainment options. Situated near Metro Lines 1 and 2, guests are able to explore all areas of the city with ease. The hotel is also 45 km from Nanjing Lukou International Airport. 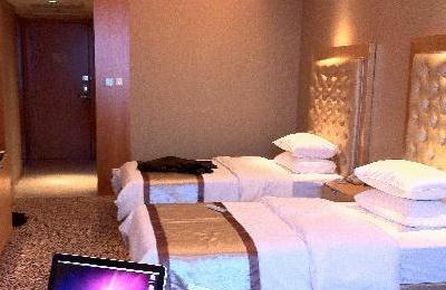 Nanjing Jinling Hotel has 585 comfortable and spacious guest rooms featuring elegant modern décor and superior amenities. Each bright and well-appointed room comes equipped with a private bathroom, LCD TV, sitting area, and free wireless internet access. Guests will appreciate Nanjing Jinling Hotel's large range of features and services, including babysitting, bicycle rental, a salon, business center, 1300 square feet of meeting facilities, guided tours of local sites, and shops for gifts. The hotel also features a coffee shop and 7 different restaurants from fine dining to casual eating that cater to all tastes. Nanjing Jinling Hotel in Nanjing! 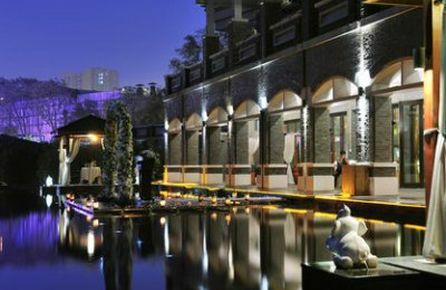 The Nanjing Purple Palace Hotel is located adjacent to the Zhongshan Scenic Area in the Xuan Wu District of the bustling city of Nanjing, with easy access to a wide variety of shopping, dining, and sightseeing options. Nearby attractions include Xuanwu Lake, Ming City Gates, Presidential Palace, and the Nanjing Museum. The hotel is also situated 35 km from Nanjing Lukou International Airport. The Nanjing Purple Palace Hotel has 350 bright and spacious guest rooms featuring colorful contemporary décor and modern amenities. Each comfortable and well-appointed guest room comes equipped with a private bathroom, LCD TV with satellite, sitting area, refrigerator, and free internet access. Guests of The Nanjing Purple Palace Hotel are encouraged to make use of the hotel's various features and services, including an indoor swimming pool, modern fitness center and a sauna. Nanjing Purple Palace Hotel in Nanjing!